I’m always looking for fun things to do that won’t break the bank. Today, we decided to visit the Herr’s Snack Factory Tour in Nottingham, PA. The tour takes about an hour and it is all walking, but there are elevators so its completely wheelchair & stroller accessible. I made the mistake of letting my youngest walk, and then he decided he wanted to be carried the entire time, so I’m hurting right about now. The tour starts with a brief movie about the history of the Herr’s company, and then the tour guides break the room into groups of about 15-20 people. Even though that sounds big, our group was mostly adults so it wasn’t bad. Along the tour, we got to see how Herr’s makes pretzels, corn & tortilla chips, and their famous potato chips – you know the super yummy ones in the blue bag. Our favorite part of the tour – the samples of course! We got to try potato chips taken directly off of the line, while they were still warm. Six minutes earlier, those chips were still potatoes! You can’t get much fresher than that. While on the tour, we also got to see the various stages of production and bagging. Fresh product moves from raw ingredients to being in the stores or shipped to customers in 3-5 days. At the end of the tour, each person was given two snack bags as a souvenir, but, like any museum tour, it concluded in the gift shop. We bought a few OOPS! bags of pretzels, bags that are either over or under weight and sell for 50% off retail, and a sample bag that included a wide variety of chips and snacks made by Herr’s for us to do our own sampling at home. The Herr’s Snack Factory Tour is FREE, but they request that you make reservations in advance so they can accommodate all tour groups. For more information on the Herr’s Snack Factory Tour, visit their website. 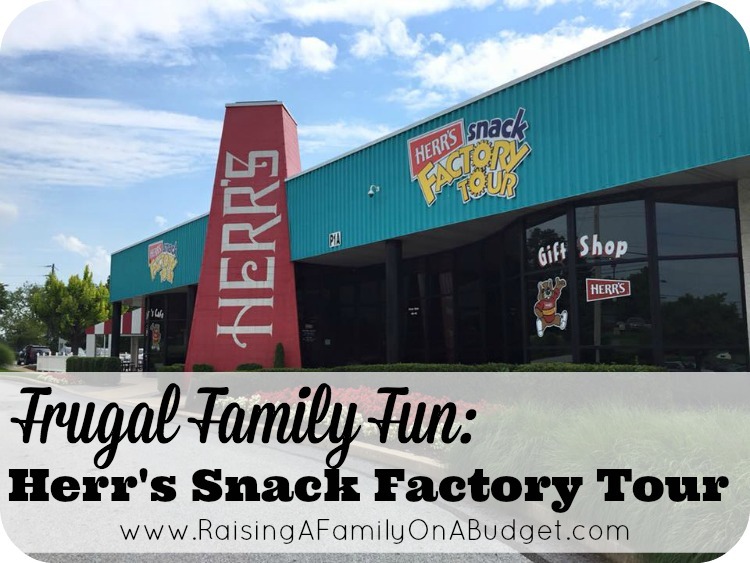 Disclosure: Raising A Family On A Budget, and this post, is in no way sponsored or affiliated with the Herr’s Snack Factory Tour. I have not been compensated in any way. All opinions are my own and based on my family’s experiences.